Come and see Perth Roller Derby's first bout for season 2013. 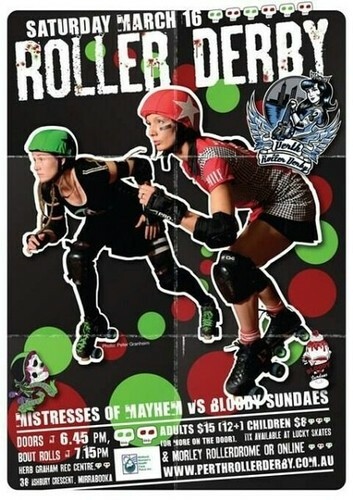 Witness the fast and furious full contact sport of Women's Flat Track Roller Derby up close and personal as the Mistresses of Mayhem take on The Bloody Sundaes. Doors open 6:45pm at Herb Graham Rec Centre, Mirrabooka. Tickets are from Lucky Skates, Morley Rollerdrome or online.